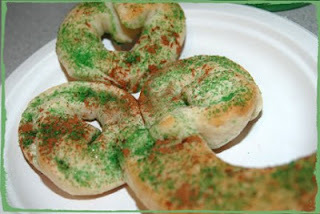 Mommy Lessons 101: St. Patrick's Day Craft and Treat: Leprechaun Hats and Homemade Shamrock Pretzels! 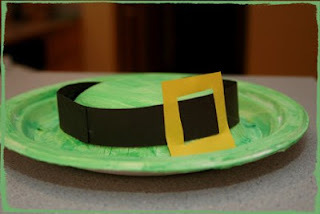 St. Patrick's Day Craft and Treat: Leprechaun Hats and Homemade Shamrock Pretzels! 1. In a large bowl, mix 1 cup warm water, 2 T. yeast and 2 t. honey. Stir this together and let it rise, while you do the next steps. 2. Melt a stick of butter in a large saucepan. 3. Add 1/2 cup honey, 4 t. salt and 2 1/2 cups of milk and mix together at medium heat. 4. Pour milk mixture into yeast mixture and stir. 5. Stir in 8 cups of flour, 2 cups at a time, and add more if needed to create dough consistency. 6. Knead the dough for 5-10 minutes. 7. Place it in a bowl, cover it and let it rise for 1 to 1 1/2 hours. 8. Pull the dough of the bowl and knead it a few times to get the air out. Pull a ball of dough, about the size of your fist. 9. Roll it into a long snake. 10. Then twist it into a traditional pretzel shape, valentine heart shape or even shamrocks! If they don't work at first, untwist them and try again. 11. After you shape each pretzel, put them on a cookie sheet about an inch apart. Bake for 20 minutes at 350 degrees. 12. Melt a stick of butter in a saucepan. 13. Right when you take the pretzels out of the oven, pastry brush them with butter generously. 14. Then sprinkle salt, cinnamon sugar, or colored sprinkles on them! This craft is so super easy. 1. Paint the bowl and plate and let them dry. 2. Cut out belt and buckle out of construction paper. 3. Glue upside down bowl to right side up plate. 4. Glue the buckle to the belt and attach them both to the rim of the bowl. 5. Optional: You could easily attach a piece of elastic if you actually wanted to wear it, or it could just be a fun craft/decoration.